July 5 is Independence Day in Cape Verde. This public holiday commemorates the independence of Cape Verde from Portugal in 1975. Cape Verde (the Republic of Cabo Verde) is a small island country in the Atlantic Ocean located 570 km off the coast of Western Africa. The uninhabited archipelago was discovered and colonized by the Portuguese in the 15th century. In the 16th century, the archipelago prospered from the transatlantic slave trade. Most slaves were brought to Cape Verde from Western Africa. However, droughts, famines and decline of the slave trade in the 19th century resulted in an economic crisis. After World War II, world colonial system began to decline, but Portugal was intent to hold on to its colonies, which at some point were transformed into overseas provinces. In 1956, Cabo Verdean and Guinean nationalists formed The African Party for the Independence of Guinea and Cape Verde (PAICG) and started struggling for independence. By 1972, the PAICG controlled much of Portuguese Guinea. Following the 1974 Carnation Revolution in Portugal, former colonies were promised independence. 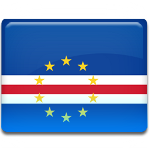 On July 5, 1975, Portugal granted independence to Cape Verde. Independence Day is a national holiday in the country. It is marked with numerous festivities, such as political speeches, parades and performances.